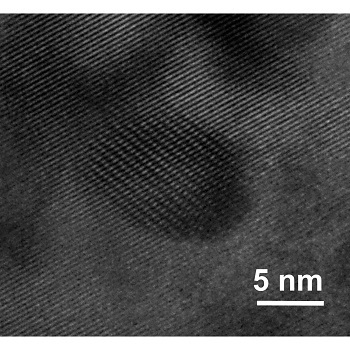 Photographic microstructure image of the material, germanium-doped magnesium stannide, showing nano inclusion with coherent boundary within the matrix. Chart showing temperature-dependent thermal properties and ZT values. Researchers at the University of Houston have created a new thermoelectric material, intended to generate electric power from waste heat – from a vehicle tailpipe, for example, or an industrial smokestack – with greater efficiency and higher output power than currently available materials. 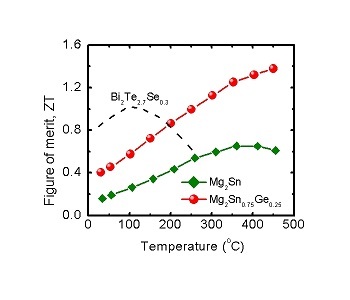 The material, germanium-doped magnesium stannide, is described in the current issue of the Proceedings of the National Academy of Sciences. Zhifeng Ren, lead author of the article and M.D. Anderson Chair professor of physics at UH, said the new material has a peak power factor of 55, with a figure of merit – a key factor to determine efficiency – of 1.4. The new material – the chemical compound is Mg2Sn0.75Ge0.25 – is important in its own right, Ren said, and he has formed a company, called APower, to commercialize the material, along with frequent collaborator Gang Chen of the Massachusetts Institute of Technology and two former students. But he said another key point made in the paper is the importance of looking for materials with a high power factor, or output power density, in addition to the traditional focus on a high figure of merit, or efficiency, commonly referred to as ZT. Thermoelectric materials produce electricity by exploiting the flow of current from a warmer area to a cooler area. In the germanium-doped magnesium stannide, the current is carried by electrons. Germanium-doped magnesium stannide has a fairly standard figure of merit, at 1.4, but a high power factor, at 55, the researchers report. That, coupled with a raw material cost of about $190 per kilogram, according to the U.S. Geological Survey Data Series, makes it commercially viable, they said. Ren, who also is a principal investigator at the Texas Center for Superconductivity at UH, said several competing materials have lower power factors and also more expensive raw materials. The material was created through mechanical ball milling and direct current-induced hot pressing. It can be used with waste-heat applications and concentrated solar energy conversion at temperatures up to 300 degrees Centigrade, or about 572 degrees Fahrenheit, Ren said. He said typical applications would include use in a car exhaust system to convert heat into electricity to power the car’s electric system, boosting mileage, or in a cement plant, capturing waste heat from a smokestack to power the plant’s systems. In addition to Ren, researchers on the paper include Weishu Liu, Hee Seok Kim, Shuo Chen, Qing Jie, Bing Lv and Paul Ching-Wu Chu, all of the UH physics department and the Texas Center for Superconductivity; Mengliang Yao, Zhensong Ren and Cyril P. Opeil of Boston College, and Stephen Wilson of the University of California at Santa Barbara.